18ct Yellow and White Gold Diamond Cluster Ring — Form Bespoke Jewellers Ltd.
A bold and beautiful, yellow and white gold diamond cluster ring. This bespoke cluster ring has been traditionally set using white gold around the white diamonds, even though the band of the ring is yellow gold. The 18 carat yellow gold band tapers on the shoulders to meet the 18 carat white gold cluster claw setting. This delicate detail helps to beautifully emphasise the bold cluster of diamonds. 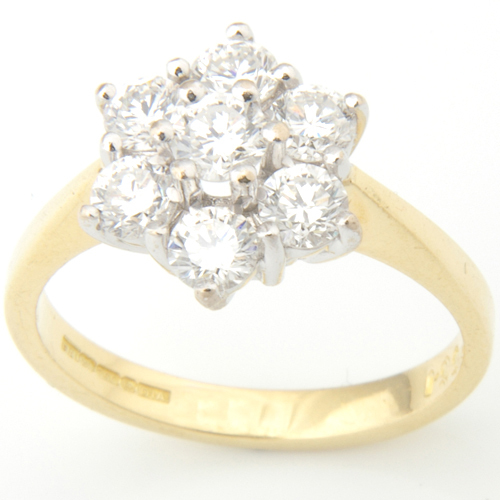 The cluster follows a halo style with one diamond at the centre and frame of diamonds around, almost like a flower. Sometimes customers choose to have a coloured precious stone at the cenre. All seven diamonds are round brilliant cut and of matching clarity and colour. This ensures that the cluster has an even, flawless finish. They have all been claw set to maintain a traditional styling across the whole ring. The ring was hand set by our expert Yorkshire jewellers and hand finished and polished by our Chapel Allerton studio.